During your lunch break, why not feed your soul as well as your body? Take some time out of a busy workday to study a bit of Torah over a kosher lunch. Every Wednesday, over a delicious Mediterranean lunch, we take one hour to explore relevant Jewish topics using ancient wisdom to guide us in a modern society. 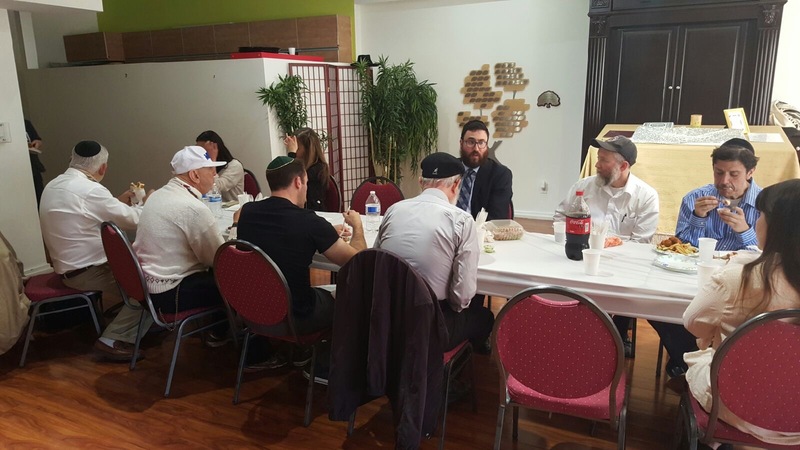 The weekly lunch at JCC-Chabad, conveniently located, is guaranteed to be a peaceful break in the midst of a fast-paced work day. The Day After: What Happens When You Come Off the Great High? The composition of the Torah portion Acharei in the book of Leviticus, is one of the most paradoxical and puzzling in the entire Chumash—a blend of splendid holiness with grotesque profanity. The portion (Parshas Acharei, Leviticus chapters 16-18) is basically divided into two sections. The first half of the portion deals with the holiest and most spiritual day in the Jewish calendar, Yom Kippur, and its magical ingredient for renewal. It discusses that rare moment, occurring once a year, when the holiest man of Israel, the High Priest, would enter the holiest space on earth, the chamber in the Temple known as the "Holy of Holies" where he would perform special services. This day was designated to bring atonement, cleansing and healing to the Jewish people and to the entire world. Yet, soon after this, the Bible moves on to caution us against vulgar expressions of intimacy. "Do not follow the ways of Egypt where you once lived, nor of Canaan, where I will be bringing you," states the Torah. It then proceeds to enumerate a long list of sexual activity from which a human being should abstain, including intimate relations with one's father or mother, siblings, uncles and aunts, very close relatives, other married women, etc. Finally, the Torah concludes, "Do not perform any sexual act with an animal… A woman shall likewise not give herself to an animal and allow it to mate with her. This is an utterly detestable perversion.' Do not let yourself be defiled by any of these acts…You shall not cause the land to vomit you out when you defile it, as it vomited out the nation that was there before you." The class takes us on a journey into one of the most meaningful lessons in the Jewish approach to morality. You may be flying high in heaven; your heart may be melting away in celestial ecstasy; your soul may be ablaze with a sacred fire and your heart may be swelling with inspiration. Yet you must remember that in one day from now or in one month from now as circumstances alter, you may find yourself in the muck. At this critical moment of an inner spiritual explosion, you must stock up the resolve and commitment to retain your integrity during your lowliest moments that may come ahead.